Tag Heuer has been constantly re-inventing the Monaco style watch models, and to celebrate the 40th Anniversary of the Monaco watches the Swiss maker launch a new stylish timepiece- The Monaco Calibre 12 Automatic Chronograph CAW2111.FC6183. This men’s watch is a symbol of precision, innovation, and performance. The sapphire scratched resistance crystal is beautiful as is the material that the watch is made from. The striking stainless steel material and the remarkable alligator of which this bracelet is what makes this a highly sought after timepiece. 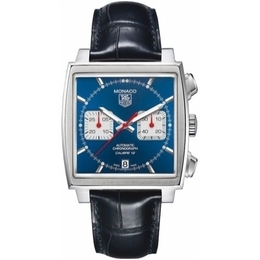 What makes this watch popular through out the world is the distinctive blue strap and blue dial. The remarkable materials makes it a comfortable yet elegant wear for every man. This Calibre 12 Automatic Chronograph watch has a 7 inch adjustable strap with the calendar date located at 6’oclock. In a blue or black dial the silver tone hand and index markers features two sub-counters. The small second hand is at 3’oclock and the minute counter at the 9’oclock position. The minute and hour hands are rhodium plated and faceted polished with luminescent markers that makes the watch easy to read. This timepiece has not lost the original spirit and design of its 1969 predecessor worn by Actor Steve McQueen in his film “Le Mans” which is dedicated to motor racing. The 39mm stainless steel case is a tad larger than the original model, but just as its original this classic watch is compact to wear with any kind of dress. From jeans to slacks, to the board room to the golf course, this watch can be worn with anything and worn anywhere. Tag Heuer watches carries within it the vision of entrepreneurship, innovation, an obsession with ultimate precision, and a deep love of prestigious sports which is the vision of its founders Edourd Heuer and his sons Jules Edourd and Charles Auguste. Consider this men’s watch in your quest for the perfect designer timepiece for yourself or as the ideal gift. This watch is one of the hottest men’s watches on the market, and will be not only a stylish accessory for the wrist, but also an accurate timepiece. The Monaco collection since being re-vamped in 1997 has made an instant success and have been the most important part of the Tag Heuer’s family ever since. Tag Monaco is great, except for the astronomical costs of replacing the leather strap, in my experience pretty regularly as it wears at the point of the clip. Recent quote exceeds £300 and was only replaced 12 months ago! High quality strap, but very difficult to fit any alternatives.